Motivate your team -- catch them when they do something right! Ngoc Mai was so proud of her $2 Award she took this pic and put it on Facebook. Want your people to achieve great things again and again? It’s easy — catch them doing something right. Make them feel good when they achieve something great. People like to feel good. If you make them feel good when they do X then they’re more likely to repeat X. This ain’t rocket science. I’m always thinking of ways to reward people for behavior that helps our team achieve its goals. 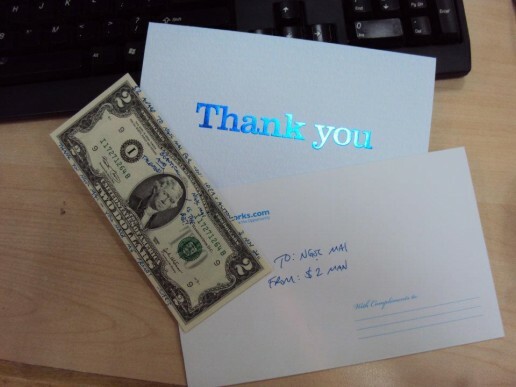 It’s especially important to reward people when they do something cool that is above and beyond their job description. That’s why I created the $2 Award. The $2 Award is given to the Dream-Maker (what we call our employees) who i) has and idea, and ii) takes action. That’s it. I put on a funny wig and glasses and run around the office with a noise-maker. Then I zero in on the person receiving the $2 Award. I ask them to stand up, then publicly announce to everyone what that person’s idea was, what action they took and why it made a difference to us. $2 bills are considered lucky in Vietnam. Ngoc Mai’s idea and action was to create the “Voice of VietnamWorks” radio program. She dedicates songs to the VietnamWorks girls each morning and afternoon, giving each song meaning and creating a fun spirit. The VietnamWorks Girls love it! What a great idea. I had to give her with the $2 Award. I’ve also created the Rocket Award (given to the Dream-Maker who runs like a rocket, lets nothing stop them and achieves something big) and the Spirit Award (given to the Dream-Maker who best shows our values). Each award has a special meaning. When people get it not only do they feel happy and proud, but others understand the kind of behavior that results in being rewarded and feeling good. Create your own awards and infuse them with meaning. Brand them. Talk about them again and again. Then catch people doing something right and reward them publicly. You’ll be shocked at their motivating power and, besides, it’s fun! 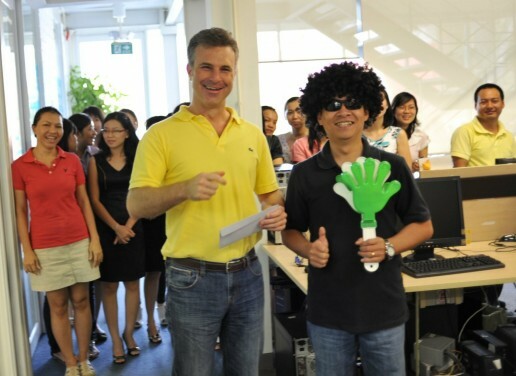 On my birthday Mr. Trong, our National Sales Director, gave me a $2 Award. It was a little weird to be on the receiving end, but felt great! Watch video of me giving a $2 Award in the video in this post. As far as I know Vietnamese banks do not carry $2 bills. I bring them back from the USA. They are prized here. Wow this is a really cool idea. I was looking up the “catch them doing good” phrase for my cert 3 in business and if I ever run my own business I’d love to adopt an idea like this into the workplace to make employees feel appreciated.